Beautification projects come with their usual messy clean-ups after the fact; the debris, the accidents, the spillage, the dust… Self ‘beautification’, particularly for the ladies, is no different at times. The palettes and the products present with an impending spillage doom. A makeup stain is almost always imminent – when and where will something fall, and unto what unwanted surface? Where will need a good clean after some intensely pigmented skin product finds it way where it doesn’t belong? Still, the projects must go on. Even with the likelihood of causing some kind of soiling and staining every day, the best face must go out the door to greet the world, clean and nicely done up! This is the reality that got our young female customer to call Home Maid Clean carpet cleaning team regarding makeup stains on her carpet in her bedroom. She needed a reliable carpet cleaning solution to the mess that is an almost inevitable by-product of her daily makeup routine. Our carpet cleaners assessed the bedroom carpet to ascertain the extent of the carpet stains, the kind of pigment (including the ingredients – whether it’s oil based or water based) and what it would require to effectively clean the carpet. 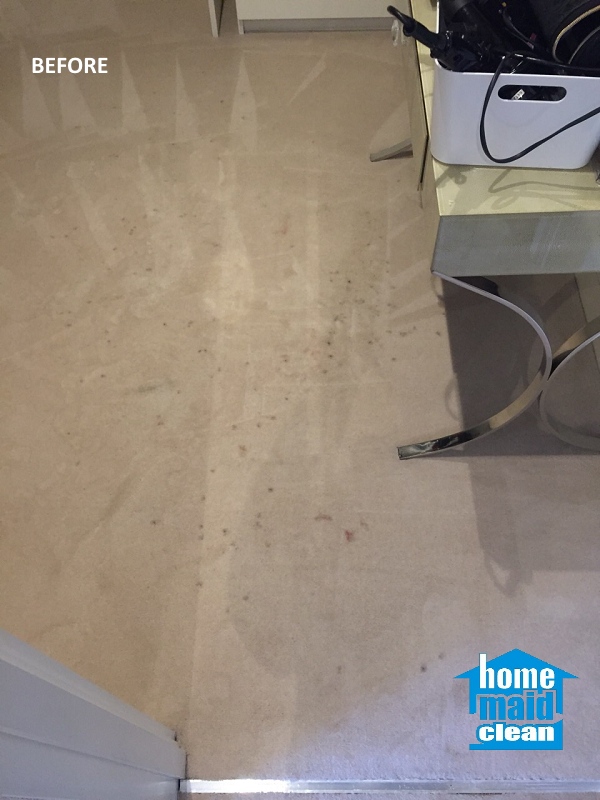 The expert conclusion was to use Home Maid Clean’s signature steam carpet cleaning to remove the stains completely with no threat to the integrity of the carpet in any way; so that the true colour and the fibres of the material would remain after the stains were removed. By strictly following our 9-step carpet cleaning process and using our professional, powerful carpet cleaning equipment (see our post on the recent upgrade in our carpet cleaning machines), all makeup stains were treated and thoroughly removed from the customer’s light-coloured carpet. Following our expert selection of a carpet stain removal method, completely safe for the fabrics of the carpet, no damage to the carpet material had occurred. All the makeup stains were cleaned out from the bedroom carpet. The steam cleaning of this carpet removed all dust, dirt and other pollutants right along with the makeup stains! The carpet colour was refreshed and the unpleasant odour triggered by the dust and dirt captured into the carpet fabrics was completely removed. 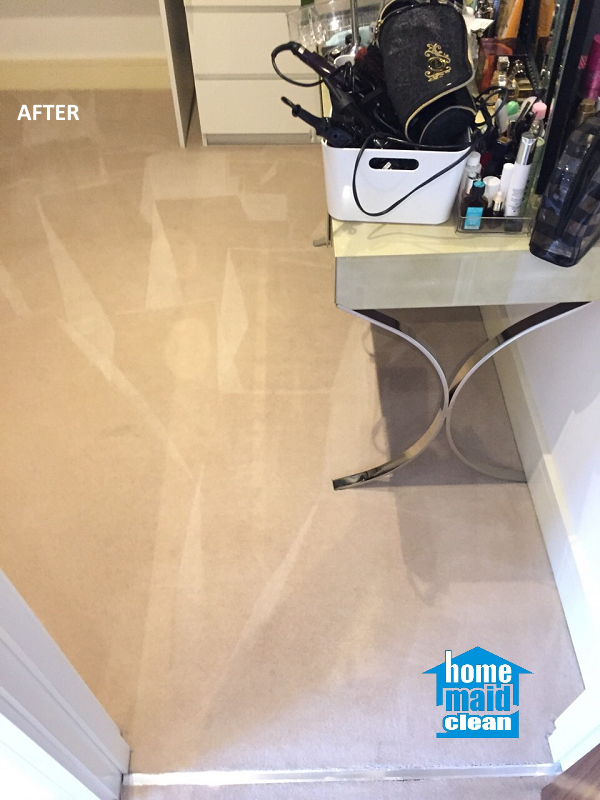 Our customer was happy that the makeup stain removal also resulted in a fresh, bright and clean carpet all over! Targeting a particular stain means an overall clean with Home Maid Clean. As the most thorough carpet cleaning company, we guarantee this! Check out our carpet cleaning service and call us to book a clean for you. We are a recommended London carpet cleaner and look forward to having you join our list of happy customers. We clean carpets and rugs everywhere in London, all carpet sizes, all carpet types, any type of stains and soiling. © Home Maid Clean Ltd 2016 – All Rights Reserved.